A Year of Being Here: Hafiz: "Now Is the Time"
"Today" by Hafiz. From the Penguin publication The Gift: Poems of Hafiz. Copyright © 1999 Daniel Ladinsky and used with his permission. 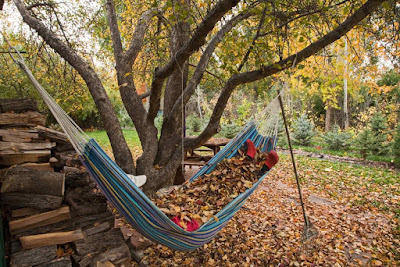 Art credit: "Raking Leaves," photograph by Chris Brown Photography. Curator's note: Today's post is a collaboration with subscriber Chris Brown, who selected one of his photographs to accompany Hafiz's poem. Chris writes of his selection: "Doing simple things, like chopping wood, carrying water and raking leaves, nourishes sacredness." He also notes that the photograph is "a tongue-in-cheek misrepresentation" of his wife, "as she is an energizer bunny, and never stops moving. It was a challenge to get her to sit still long enough to make this picture. "